The impassioned words of Thomas Bushell cut through the hushed Washington Navy Yard courtroom during the May 25 special court-martial as the grieving father fought back tears to pay tribute to his son, Electronics Technician 1st Class Kevin S. Bushell, one of 10 sailors killed when the destroyer John S. McCain collided with a 600-foot-long oil tanker on Aug. 21. The father was one of a handful of Kevin Bushell’s relatives who made statements about his son. 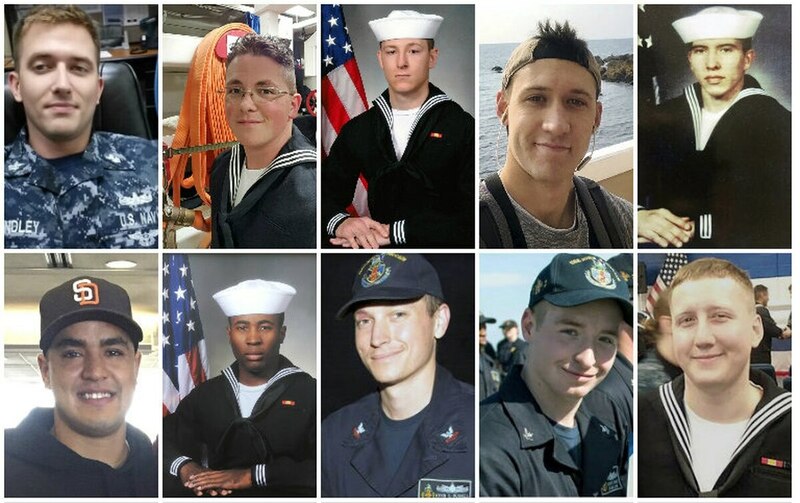 He was joined by family members of other sailors who also died on the ship, including Information Systems Technician 2nd Class Timothy Thomas Eckels Jr., Electronics Technician 2nd Class Dustin Doyon, Interior Communications Electrician 2nd Class Logan S. Palmer, Chief Interior Communications Electrician Abraham Lopez, and Chief Electronics Technician Charles N. Findley. One-by-one, 15 gut-wrenching statements were read while the destroyer’s crestfallen former commanding officer, Cmdr. Alfredo J. Sanchez, sat only feet away, listening intently. The statements came during the sentencing phase of the court-martial following Sanchez’s guilty plea for dereliction of duty. Thomas Bushell said his weight dropped from 220 pounds to under 175 in the months following his son’s death; he no longer has a desire to keep the business he wanted to pass on to his son and he said he has difficulty finding purpose each day, a sentiment echoed by other family members. “Making it through a full day and acting like everything is OK is exhausting,” said Bushell’s step-sister, Stephanie. Krystal Bushell, Kevin’s sister-in-law, told the court she has “spent many sleepless nights wrapping my arms around [her husband] while he cries for his brother. The destroyer John S. McCain collided with the oil tanker Alnic MC a little after 5 a.m. on Aug. 21, puncturing a 28-foot hole in the warship and sending hundreds of bewildered sailors into a frenzy of survival and rescue. Sea water and oil rushed into the newly-created cavity on the port side of the ship that had once seemed impenetrable to those serving onboard. Berthing 5, a 15-foot area that was crushed into a space of only five feet, flooded almost instantly. Twelve sailors from the berthing were resting when the collision rocked the ship — 10 were soon reported missing. He was certifying sailors who did not know how to use the basic ship-steering equipment. Back in the U.S., families of the missing sailors flew from all over the country to join together in solidarity and prayer, clinging to hope that their loved one would defy the odds and emerge unscathed. “[We] waited for our fears to be dismissed, because denial told us Kevin would be coming home again,” said Bushell’s step-sister, Stephanie, who said she collapsed when she received the phone call confirming Kevin was dead. Winters was celebrating her birthday when she learned of her brother’s death. Nothing has been the same since, she said. On the stand, the brother of another sailor, Abraham Lopez, read a statement from the sailor’s wife, who had the colossal charge of comforting the couple’s daughter during the turmoil. Lopez, 39, needed just over three more months of Navy service to reach his 20-year mark and retire. But because he died only months before his December 2017 end-of-service date, his brother said his family will receive none of the benefits afforded to a retired sailor. A Navy official who spoke on background, however, did say that “survivors of deceased service members receive benefits that include a monthly benefit called Dependency and Indemnity Compensation, a one-time death gratuity, Service Member’s Life Insurance payment, one year’s housing allowance, and Tricare coverage for children until age 21 and surviving spouses until remarriage. Thousands of miles away from the other families that August morning, a newlywed scrambled to keep abreast of the McCain’s search-and-rescue efforts. Riho’s first visit to the United States and first introduction to Charles’ family was for his funeral. One after another, each statement yielded nightmarish details of the minutes and hours before and after receiving the inconceivable news. “That day will be scorched in my mind,” said Rachel Eckels, mother of Timothy Thomas Eckels Jr., 23. Assigning blame has proven difficult in the collisions of both the destroyer Fitzgerald and the McCain. It took extensive reviews by the Navy to determine that the sea service, not the other vessels, were at fault in both catastrophes. Deciphering which sailors were most culpable in each wreck has added yet another layer of complexity in the subsequent proceedings. Many family members of the McCain sailors, however, implied that blame doesn't need to be equally divided. When it came time to read her statement, Karen Doyon, the mother of Electronics Technician 2nd Class Dustin Doyon, 26, took the podium wearing her son’s dog tags. Without an alarm or warning, Logan Palmer, 23, became trapped in Berthing 5. Palmer had only been on the ship for a few months and enlisted in the Navy just over a year before the collision. “For 23 years we raised him, kept him alive,” the sailor’s mother, Theresa Palmer, said through tears as she looked at Sanchez. “We handed him off to you for three months” and he was killed. After the final family member in attendance was seated, Sanchez was offered the opportunity to issue a statement of his own. The former commanding officer then asked the families to find some solace in the notion that their loved ones “were with family” when they died. As part of a pretrial agreement, Sanchez pleaded guilty to dereliction of duty for his role in the collision. 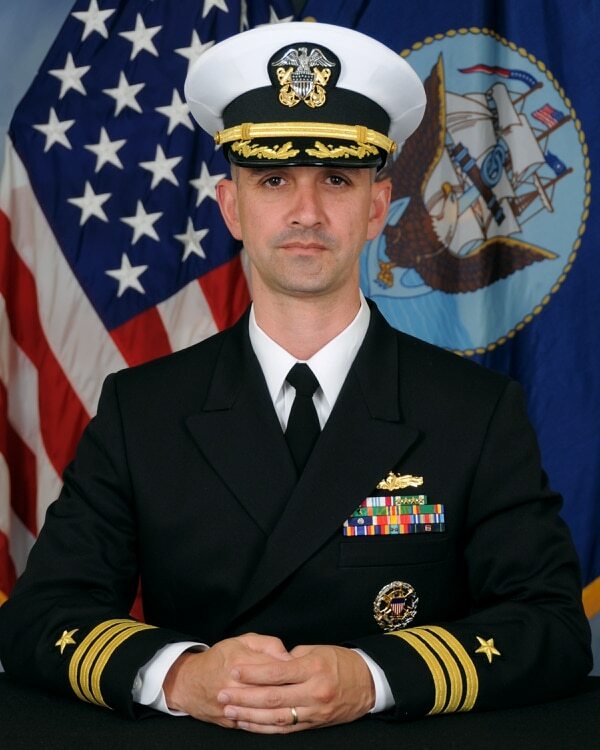 He was sentenced by Navy judge advocate Capt. Charles Purnell to a letter of reprimand and a forfeiture of $2,000 per month for three months. He currently has a base pay of $9,009 per month. Also as part of the plea deal, Sanchez will submit a retirement request. Toward the end of the court-martial, Sanchez’s wife of 16 years, Maria Zapata Yordan, took the stand, tearfully describing the effect of 10 lives weighing on her husband. “Part of this process is about closure,” Sanchez’s defense attorney, Cmdr. Stuart Kirkby, told the court. Turning toward Yordan, Kirkby asked whether the court-martial would bring Sanchez any such closure.